Hailed by Lena Dunham as an "essential (and hilarious) voice for women," Lindy West is ferociously witty and outspoken, tackling topics as varied as pop culture, social justice, and body image. Her empowering work has garnered a coast-to-coast audience that eagerly awaits Shrill, her highly anticipated literary debut.West has rocked readers in work published everywhere from the Guardian to GQ to This American Life. She is a catalyst for a national conversation in a world where not all stories are created equal and not every body is treated with equal respect. 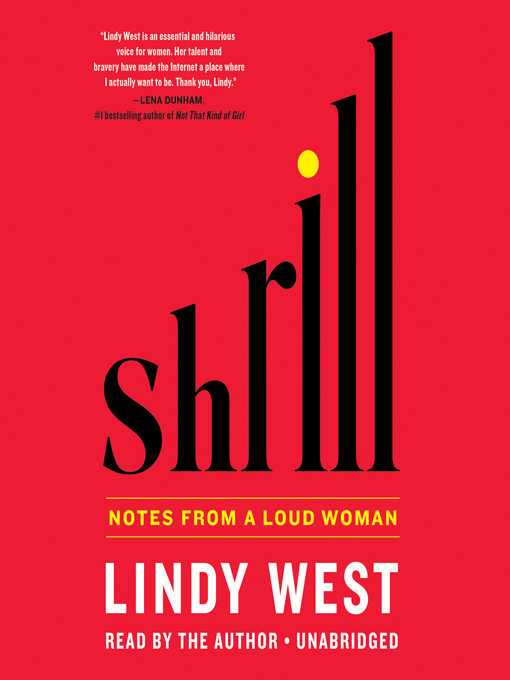 Shrill is comprised of a series of essays that bravely shares her life, including her transition from quiet to feminist-out-loud, coming of age in a popular culture that is hostile to women (especially fat, funny women) and how keeping quiet is not an option for any of us.